Just a short walk from Playa del Ingles beach is the sprawling complex of Green Field Apartments. This self-serviced aparthotel is great for a summer holiday with kids and family or a quick romantic getaway. The complex features a 24-hour reception, elevators, high-speed internet connection, buffet restaurant and an Irish tavern-styled pub. 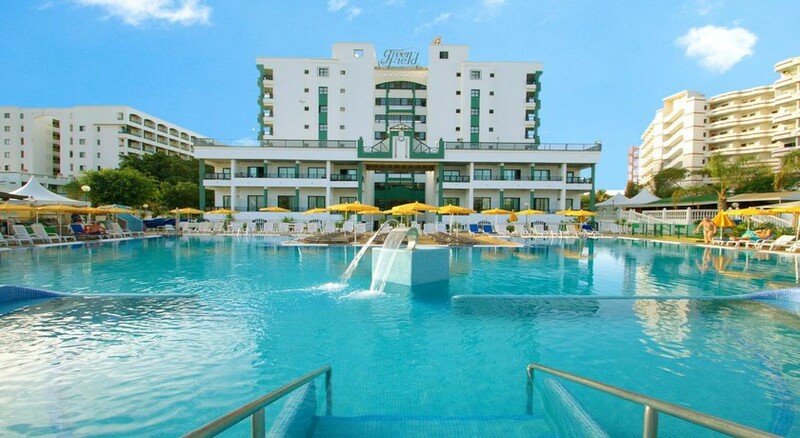 Other facilities include a heated pool, a pool bar, a solarium and a supermarket. The studios and the apartments, which come with separate sitting areas, balconies and kitchenettes, are plush and comfortable. The neighbourhood, filled with a variety of shops, restaurants and bars, provides plenty of options for evening entertainment. Overall, Green Field Apartments offer all the ingredients for a fun-filled, relaxing holiday. 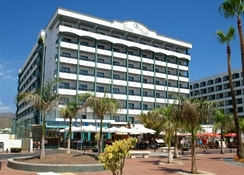 Located at the heart of Playa del Ingles, the aparthotel is a 21-minute drive from Gran Canaria Airport. Green Field is surrounded by shops, restaurants and bars – it hardly takes 10 minutes to reach the market area. The beach is about 400 metres away and the gorgeous dunes of Maspalomas are located only a 20-minute walk from the hotel. For adventure-seekers, Gran Canaria has an incredible landscape waiting to be explored via car or bus. The nearest bus stop to the hotel is 500 metres down the street. This pocket-friendly accommodation has well-furnished studios and apartments, equipped 3-star facilities. Balconies with stunning views, kitchenettes with fancy gadgets and living areas with comfortable sofa beds are just some of the highlights of this aparthotel. All rooms come with air-conditioning, en-suite bathrooms with showers, telephone, fridge and Wi-Fi facilities. Tastefully decorated and donning a modern, swanky look, the rooms come in two categories: studios with two single beds and fully furnished apartments, which are perfect for a family of four people. The aparthotel houses a restaurant and an Irish Pub, which serves lip-smacking snacks and delicious cocktails. Each apartment or suite comes with a kitchenette, which is great for rustling up a quick meal. There’s never a dull moment at Green Field Apartments. 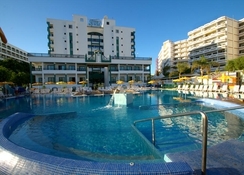 The well-kept outdoor complex of the hotel has an expansive pool, which is good for a splash on a hot summer afternoon. The pool bar offers an array of snacks and cocktails, while a separate sun terrace with parasols and sun loungers provide the perfect nook for guests looking to relax under the summer sun. if you’re a beach bum, the golden sandy beaches of Gran Canaria offer loads of water sports and activities. Facilities for games such as table tennis and billiards are also provided at an extra charge. Gran Canaria at large makes for the perfect day trip or excursion, be it a visit to Casa de Colon, a museum featuring discoveries and artefacts from the Columbian exploration, or a trip to Las Canteras Beach, which is the mecca for all kinds of water sports in the region. very good value for price, lively area a little bit of a climb down to beach . Went away with a group of friends and were warmly greeted at reception. No I’ll judgement by staff. Quickly got to our rooms. Very nicely designed room with fridge cooker if you were self catering? Bathroom was modern and spacious. Pool nice. Disabled friendly if you require it. Pool bar easy going with buffet for all inclusive customers. Readily stocked to keep you going. Bar staff very friendly. Good policy with pool chairs. If bums aren’t on seats for 1/2 hour towels are readily removed. Restaurant had a variety of food available. Clean and organised. Staff attentive and helpful. All in all nice break. Felt appreciated by staff and nothing was a chore. Excellent hotel. Good food. Friendly and helpfull staff. Lively resort. Also booking was made simple and hassle free through teletext holidays. We loved our stay at Greenfield- spacious &clean place. Ralaxing reception, good wi fi. Restaurant a bit dark, but food was nice. Rooms are comfortable, no issues at all. Would go again!